Situated on an equestrian estate our Cottages are the perfect mix between Langebaan peace and tranquility and a farm environment. 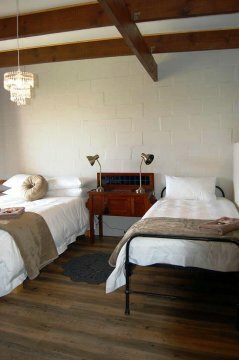 We offer three self-catering cottages which have one bedroom each with open bathroom, an open plan living area with a kitchen leading out to a little stoep to the maintained lawn.All are fully equipped with linen, towels, hotel package DStv, with free Wi-Fi throughout, basically all the necessities you need.The Vintage Queen Caravan is for those guests who only needs a one night stay (or more) and a comfortable night sleep with a nice morning cup of coffee before on the road again. Equipped with the basic eat ware, appliances, linen, towels and free Wi-Fi. The Stables Cottages offer you ocean lagoon mixed with farming livelyhood and a never ending view! Rustic vintage feel cottages with own yard and lawn, springbucks, chickens, ducks and geese on your doorstep. Langebaan is situated 120 km north of Cape Town, in the Western Cape province of South Africa on the eastern shore of Langebaan Lagoon, just off the R27, about 28 km from Vredenburg and 20 km from Saldanha Bay. The Lagoon stretches for 17 km from Saldanha Bay, past Langebaan to Geelbek in the South. In places it is up to 4 km wide. The area is rich in historical events from the first inhabitants, the Khoikhoi and San, to the arrival of the Europeans. The first European to set foot on land was Vasco da Gama at St Helena Bay on the West Coast Peninsula in 1497.